The Bradford Playhouse was originally built as a Theatre and Cinema by Eric Morley in 1937 on the site of the former Jowett Hall Temperance Hall, which was built a hundred years earlier in 1837. The Temperance Hall had been converted into a Cinema in 1910 and from 1929 was run by the Bradford Playhouse Company as the Bradford Civic Playhouse and Film Theatre. The well known novelist and playwright J. B. Priestley was the President of the Theatre from 1932 until his death in 1984. Sadly the original building was destroyed by fire in 1935 but in 1937 a new Theatre was built on the site, with funds from a donation of royalties from several of J. B. Priestley's plays. The new Theatre was designed as a Cinema and Theatre and was reopened by Sir Barry Jackson in January 1937. It was run as an amateur Theatre with films shown between the plays. 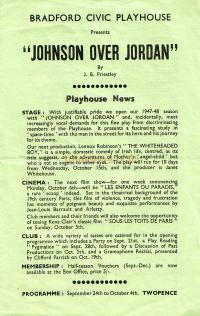 Right - A Programme for 'Johnson Over Jordan' by J. B. Priestley at the Bradford Civic Playhouse in 1947 - Click for details. A serious fire in July 1996 destroyed the stage and damaged the auditorium and FOH areas of the main Theatre, however, plays continued in the attached Studio Theatre whilst the main Theatre was restored. It reopened as the Priestley Centre on Friday the 31st of October 1997 with a production of J. B. Priestley's 'An Inspector Calls'. The newly restored Priestley Centre had two auditoria, a 291 seat Proscenium Arch Theatre on two levels, Stalls and Circle, and a 70 seat Studio Theatre with movable seating which was easily adapted to any configuration. The main Theatre also has a 22 foot screen with full Dolby Surround sound. For the next few years the Priestly Centre was often in the news as it struggled with finances and several times it nearly went into liquidation but was then rescued. However, in September 2011 the Theatre finally went into Liquidation with reported debts of around £300,000. After this Rob Walters, a former chairman of the Playhouse, reopened the Theatre as the Litttle Germany Theatre. This continued until 2012 when Clare and Jono Gadsby took over the lease of the Theatre for six months, renaming it the New Bradford Playhouse, all the time still under the control of the Liquidators. 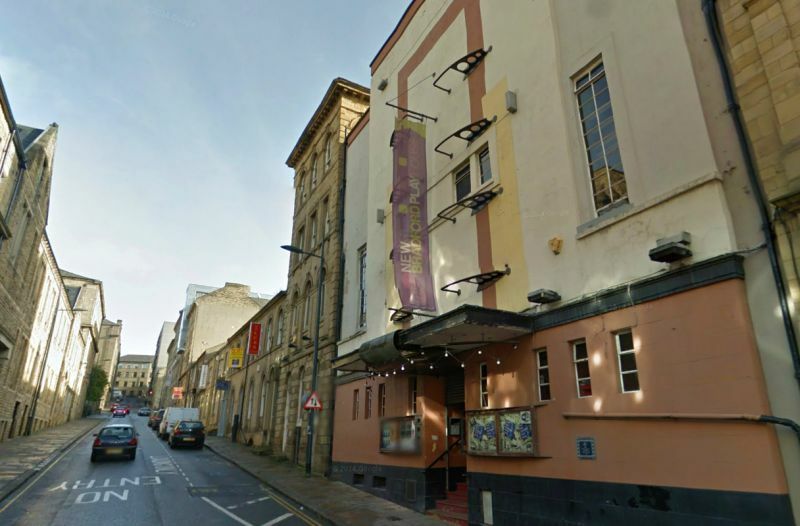 Eventually the Liquidators announced that they would be putting the Theatre up for auction on the 10th of July 2014 but an appeal by Megan Murray of the friends of Bradford Playhouse hoped to delay this. However, in July 2014 the Theatre was bought by Colin Fine, a local Theatre enthusiast who continues to run the Theatre as a live theatre now renamed the Bradford Playhouse. You may like to visit the Bradford Playhouse's own website here.